Ketchikan: Listen to this story... The Ketchikan City Council on Thursday night passed in the first reading a $4 cruise ship passenger fee. As Deanna Garrison reports, the fee likely will pay for a massive port expansion that will include additional cruise ship berths, a tram system and pedestrian improvements to Ketchikan's downtown. Ketchikan: Listen to this story... Juneau resident and former Southeast Seiners Association and United Fishermen of Alaska Executive Director Kate Troll recently released a new book. As Deanna Garrison reports, the book discusses the possibility of promoting environmental protection and economic development. 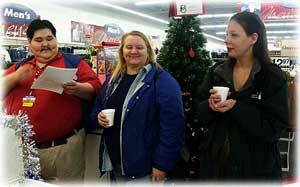 Wal-Mart employee Jeff prepares to present a check on behalf of Wal-Mart to the Toys for Kids program. Also shown are Ketchikan Harley Riders' President Paula Falzarano and Heather Rogers. Ketchikan: Toys for Kids Program Kicks Off With $1,000 Contribution From Wal-Mart - In a ceremony Friday morning, an appreciative Ketchikan Harley Riders Association accepted a generous check in the amount of $1,000 from Wal-Mart for the annual Toys for Kids program. The contribution by Wal-Mart will be used by the Harley Riders Association for purchasing toys and gifts for children and teens in Ketchikan, Metlakatla, and Prince of Wales Island. 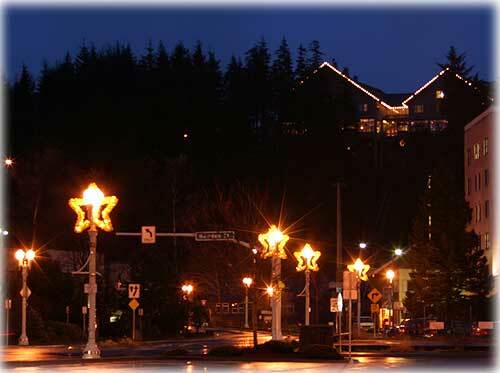 Ketchikan: Christmas Tree for W.I.S.H.es - Santa is getting a head start in Ketchikan this Christmas thanks to some of his helpers. Members of Ketchikan's United States Coast Guard Spouses Association have been busy organizing food boxes and gifts for families. 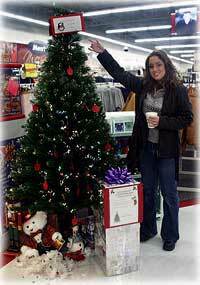 Jacqueline Draper, a member of the Coast Guard Spouses Association said, "The Spouses Association wanted to do something to help both adults and children in Ketchikan have a merrier Christmas." The crew of the United States Coast Guard vessel the Anthony Petit donated food from the Haunted Ship for the food baskets and the Chiefs Association of the U.S. Coast Guard donated turkeys. The Spouse's Association approached Wal-Mart requesting to set up a box outside to collect donations. Wal-Mart instead generously bought a tree and provided a place within the store for the group to put this special tree - the Christmas Tree for W.I.S.H.es. The tree is decorated with ornaments with ages and sizes written on them.